Print partners are taking full advantage of Hop Industries’ quick turnaround of Hop-Syn synthetic paper orders. With a wide variety of inventory totaling more than one million pounds of the popular substrate on hand in Hop’s NJ warehouse, orders are shipped within 24 orders of being placed. 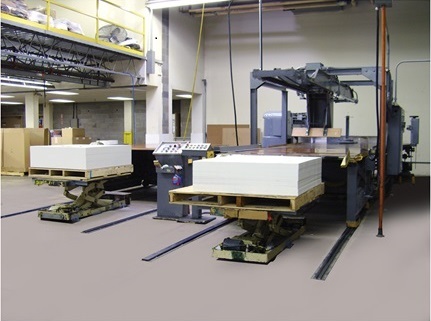 For custom-sheets and roll sizes that need to be converted, Hop can produce these orders within a minimum of 2-3 days. Now that’s fast!. The immediate availability of Hop-Syn synthetic papers means that print partners can respond quickly to clients’ projects. Whether printing backlit advertisements, P-O-P displays, banners, window posters, and more, Hop-Syn synthetic papers are immediately available from Hop’s fully stocked NJ warehouse. Hop-Syn comes in the following six synthetic paper grades G1, G2, XT, TO, DL and BL. The synthetic papers have the look and feel of pulp-based paper, but with the durability of plastic. Hop-Syn comes in both roll and sheet sizes, and in various gauges. Standard master rolls are available in 52.5-, 55-, and 61-inches. Standard stock sheet sizes are 25×38-inches, 26×40-inches, 28×40-inches. 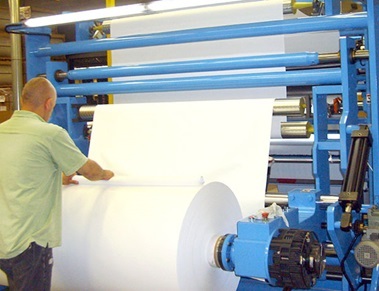 Hop’s in-house converting services make it possible to customize the roll and sheet sizes to meet customers’ specific requirements. Brand manufacturers and their print partners are welcome to visit the Hop-Syn warehouse to see Hop’s in-house converting and stock inventory. Print partners are also encouraged to reserve the Hop-Syn synthetic paper and have it stored in Hop’s warehouse for up to six months for guaranteed inventory of special sizes. Hop is ISO-9001 certified to meet with all consumer manufacturer requirements for traceability. Hop is also REACH certified for meeting environmental requirements for North America and Europe. A Hop-Syn expert is always available to answer technical questions about the substrate, whether it’s printing or any custom fabricating process. For more information contact Hop-Syn technical sales at 800.524.0757 or fill out the online form.